We're officially halfway through the month of July friends, and that means it's time to link up your Classic Meets Modern blocks. The two blocks for this month are ones that are extremely well known, and versions of them have been used over and over again for decades. The first is the Bowtie block, and it is one of my favorites. 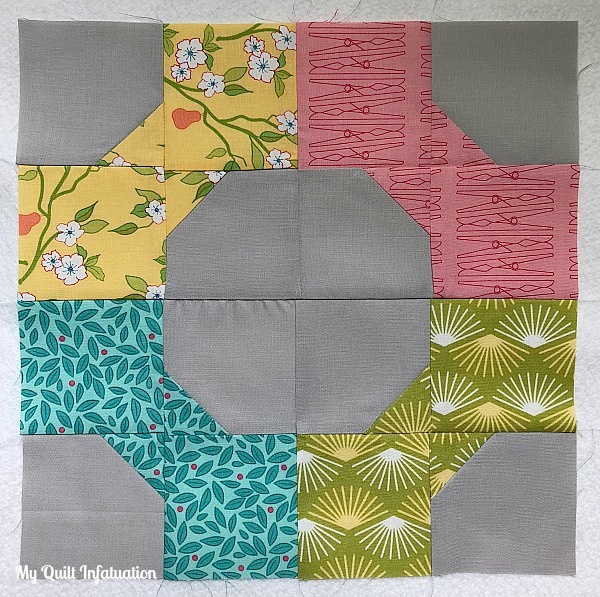 If you look at my quilt designs, you'll notice that I love quilts and blocks that have a curvy look without actually sewing curves, and the Bowtie block accomplishes this beautifully. When the blocks are all put together in a quilt, they create a gorgeous, rounded lattice pattern. I chose a gray background for my block, and the softer colors in the prints really stand out against it. The second block for this month is the Weathervane. I love the shape of this block, and they make a beautiful secondary pattern when put together as well. I decided to use one of the larger prints in the Acreage collection for the larger pieces in the block. 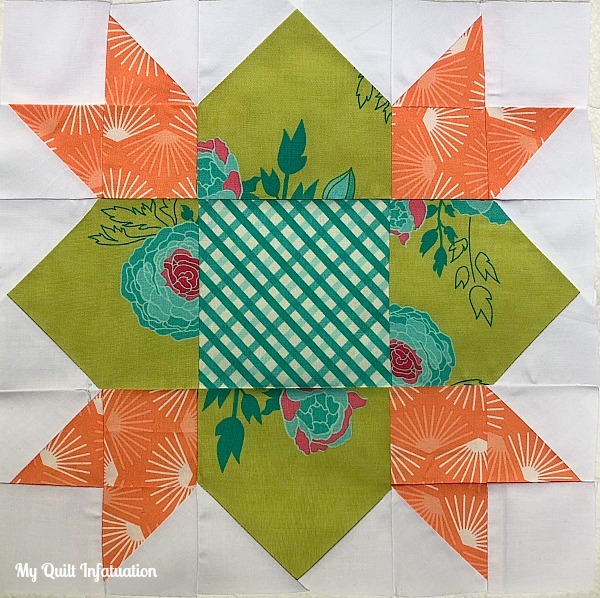 I didn't fussy cut because I needed the green to be the predominant color in the block, but I like that the large blooms in the print are peeking out just enough. By the way, if you have fallen behind and catch up on your blocks in a single month, just add those blocks to your current post so we can see them. It's okay if your July post includes blocks from previous months. There's no QAL police here. Let's link up! 1. If you're a little late to the party, it's okay! You can still join in anytime. This is a Block of the Month Quilt Along, so we will only be completing two blocks each month. The pace is leisurely and it will be easy to catch up. You can get the Classic Meets Modern pattern in my Etsy or Craftsy shops (links on my right sidebar). As long as you have a finished quilt top at the end of the year, you'll be eligible for the prizes. 2. Remember, the link party opens on the 15th of each month, and will close at midnight CST on the last day of the month. You can certainly link to the weekly NTT post if you like, but be sure to link your quilt along blocks to this party, so everyone is sure to see your progress. 3. You don't have to have a blog to join in! You can link to an Instagram post, or even a Flickr account. Use the hashtag #classicmeetsmodernbomqal on Instagram! If you do have a blog, grab a button to let everyone know you're participating! You can get the button on my right sidebar. Being a traditional quilter and a member of a modern guild, I appreciate these blocks. I wish I had time to join in the quilt-along. Beautiful blocks! I so love the Bowtie block! Thank you for sharing! Traditional blocks that can be made modern by fabric choice. The end is in sight! Take Flight and a Giveaway! 4th of July Sales and a Giveaway!